He meets women. He gains their trust. He kills them. That's all London police detective Maeve Kerrigan knows about the man she is hunting. Three women have been strangled in their homes, and it appears to be the work of the same sadistic killer. With no sign of break-ins, every indication shows that the women let their attacker in willingly. The victims' neighbors and friends don't seem to remember anything unusual or suspicious, and Maeve is almost at a loss about how to move forward with the investigation. Then the evidence starts to point to a shocking suspect: DCI Josh Derwent, Maeve's partner on the police force. Maeve refuses to believe he could be involved, but how well does she really know him? Secrets Derwent has long kept locked away are coming back to haunt him, and the more Maeve learns about her partner's past, the more difficult it is to dismiss him as a suspect. After all, this is hardly the first time Derwent's been accused of murder. 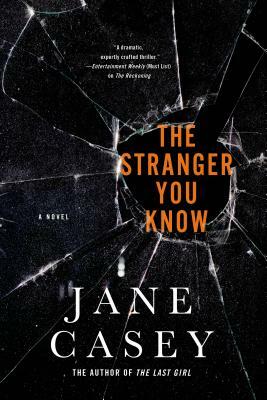 Jane Casey returns with her most outstanding novel yet in The Stranger You Know, a taut thriller and an intimate portrayal of complicated, all-too-human characters. JANE CASEY is the author of the Maeve Kerrigan novels (Let the Dead Speak, After the Fire) and the Jess Tennant Mysteries (Hide and Seek, Bet Your Life). A graduate of Oxford she also has received a M. Phil from Trinity College, Dublin. Born and raised in Dublin, she lives in London where she works as an editor.